Get Everything On The Web! What exactly should a download manager do, anyways? Well, we think that it should facilitate and streamline the downloading process for pretty much anything on the Internet. It should be able to download based on specific criteria. It should be able to download streaming and flash media. It should be able to handle podcasts and feeds. It should pick up downloading where it leaves off. It should enable organization and viewing of downloaded files. Kind of like DownloadStudio, a uber-handy app that helps you quickly and easily get your hands on programs, games, music, movies, TV shows, photos, streaming audio, streaming video, flash, flash video, documents, RSS feeds, blogs, podcasts, complete web sites, complete FTP sites, and just about anything else that you can download on the web! Single file downloader: Accelerates downloads by as much as 500%. Resumes broken or failed downloads rather than starting again from scratch. 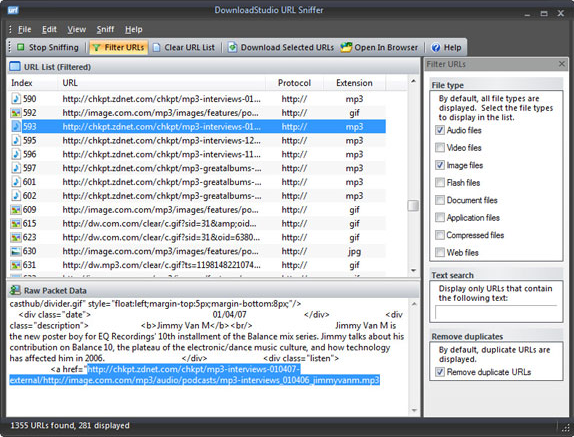 Web site downloader: Downloads complete websites or just certain files that match specific criteria. 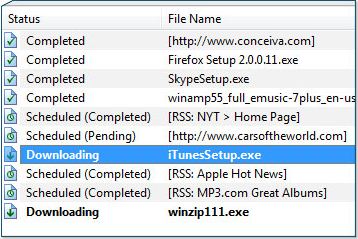 Streaming media downloader: Connects to and downloads streaming audio and streaming video directly from Windows streaming media servers. This includes live broadcasts! 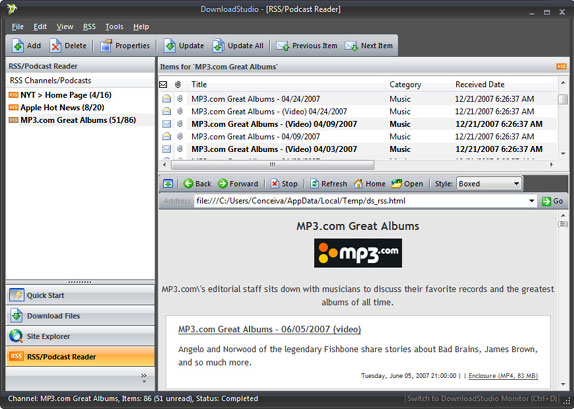 Supported formats include ASF, WMV, WMA, ASX, WVX, WAX and WSX. 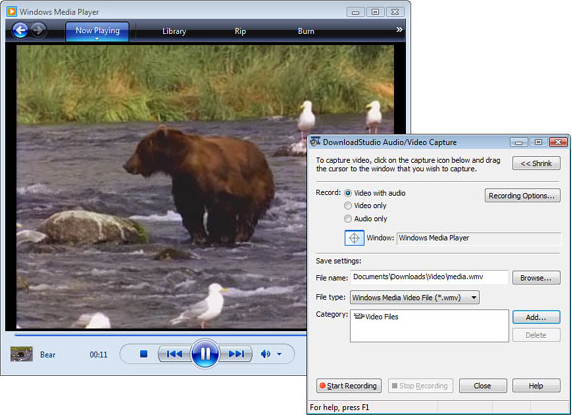 Audio and video recorder: Captures audio or video as it plays on your computer in a media player or web browser. Can record all audio and video formats. Flash video downloading: Download flash video from all popular video sites including YouTube, Google Video, Vimeo, MySpace Video, Yahoo Video, Dailymotion, Metacafe and more. RSS feed reader: View RSS feeds with an integrated RSS Feed Reader. File range downloader: Download entire collections of files from photo gallery sites, music sites, and video sites. RSS feed, blog and podcast downloader: Subscribe to and download RSS feeds, podcasts, and blogs. URL sniffer: Automatically 'sniffs' all URL traffic and displays possible downloads as each URL passes through the browser. Web site explorer: An special integrated web browser allows for easy viewing of all the links and images on a website. 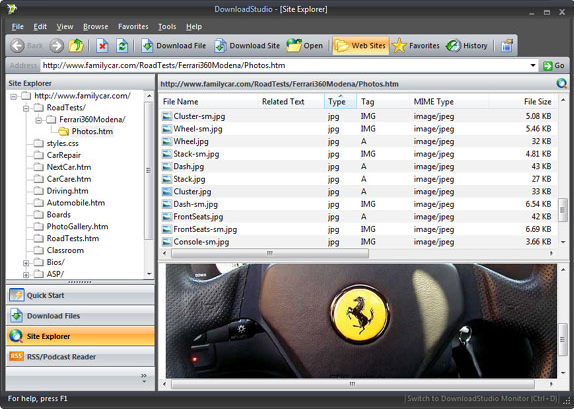 File browser, viewer and organizer: Contains a fully-featured, visual file browser that displays thumbnails for all downloaded files. Over 150 supported file formats! Works with all popular web browsers, including Internet Explorer, Firefox, Opera, Mozilla, Netscape, Maxthon, NetCaptor, Google Chrome, Flock, and more. 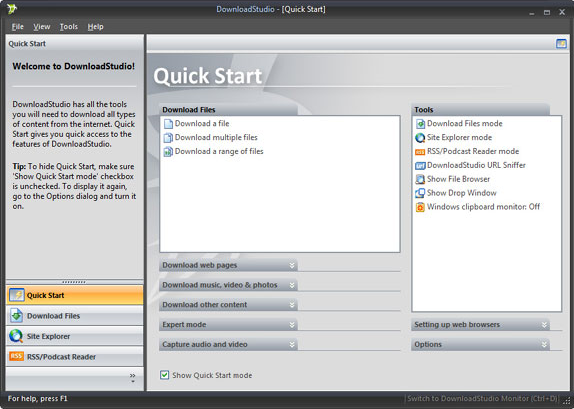 All downloads are automatically redirected to DownloadStudio for ultra-fast downloading. Download video from all popular video sites - including YouTube, Dailymotion, Youku, NicoVideo, Ustream.tv, Metacafe, Google Video, Yahoo, Vimeo, Veoh, Say-move.org, Jokeroo, Momovideo, Break, Himado, Twitter Vine, Mixi and many more. Download files from all popular file sharing sites - including Dropbox, RapidShare, 4shared, Yousendit, Filefront, Filecloud, Filefactory, Uploading, Gigasize, Netload, Sendspace, Mediafire and many more. Download photos from all popular photo sharing sites - including Instagram, Flickr, Picasa, Mixi and many more. Download from all popular social networking sites - including Facebook and Twitter. After you purchase DownloadStudio it may be used indefinitely. DownloadStudio is licensed per computer, and not per user. wts If a webpage has many PDF's on it, for example, a magazine's 12 issues for a given year, can they all be downloaded as one job rather than 12 jobs? Thanks for a very useful product at a reasonable price. John Beaumont When you get to the order page on the Conceivia website it shows a price of $17.47 not $7.48 as you show here. CL Sorry. Price is actually $7.48. After the coupon is applied you will see a -$17.47 (minus). So the final Price is $7.48 (plus tax). Paul Schumann Hi John & CL, The full price is listed on the Checkout page as $24.95 and below it is the Coupon discount of $17.47. So that totals to $7.48. If you proceed in the Checkout, you will see that your final total will be $7.48. 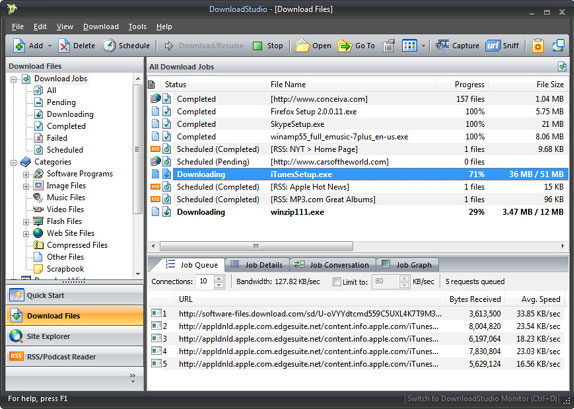 Paul Schumann Hi wts, DownloadStudio can download a single file as a separate job, or a range of files (e.g. brochure1.pdf, brochure2.pdf, etc.) as a separate job, or parts of a website as a separate job. If you need help to do this, just email us at support [at] conceiva [dot] com. Gary User I purchased both Download studio and then the promoted Mesmo Pro but have not yet received the serial numbers for either. How do I get the serial numbers? Paul Schumann Hi Gary, Our systems automatically send your registration details after your purchase to the email address you specified in your purchase. Check your spam folder or spam settings in your email program. If still not there in 1 hour, then please email us at support [at] conceiva [dot] com and we'll find your details and send them to you. My one connection problem with FileFactory -- was solved easily by using your help system. ** Edited. Robert W Here is another similar example. At: https://download.cnet.com...74500.html -- I could not figure out how to download DownloadStudio itself. I push the "Download Now" button -- and up pops a DownloadStudio dialog box. But instead of the setup file that I am hoping for -- I get an html webpage for a download. Not what I am looking for. Is there a setting or easy solution? Robert Crombie I am running the latest version of downloadstudio, and I cannot get it to download the running video on YouTube. Do you have a specific tutorial on how to do that task ? I tried adding your extension to Firefox, but it downloads some tiny file called watch instead. I tried integrating your extension into IE 11, and that was even worsre. Paul Schumann Hi Robert W, Glad you worked out to change the number of connections (or splits) to a higher number to accelerate your downloading. It's quite easy to set in the settings for your download job. Regarding downloading from certain sites, send us an email at support [at] conceiva [dot] com and we'll gladly help you out. Paul Schumann Hi Robert Crombie, Yes - you can download videos from YouTube and many other popular video sites. YouTube have recently change their site, so please email us at support [at] conceiva [dot] com and we'll supply you with a free patch that will get you up and running. Gary User if a patch is needed to use your program why don't you distributed it to everyone? Why would each user need to send an email to your support to get the patch? And if paid users aren't on this particular forum, how would they even know a patch was available? Paul Schumann Hi Gary, The patch has just been created and is being Beta tested. That's the reason for asking you to email us for early access to it (i.e. Beta test it).